Well-known as one of the most reputable web browsers, Google Chrome weighs a lot in our daily life. With high popularity, it serves us in different aspects, searching specific content, playing streaming music, delivering online lecture, making tutorial, playing game, etc. However, sometimes we also have to recording favorite audio from Chrome if we get no permission or authorization to download it. To salvage you from such a tricky situation, we'd like to show you a hot list with 5 best Chrome audio recorder Tools included as below. Joyoshare Screen Recorder for Windows (or Joyoshare Screen Recorder for Mac) is a dedicated recording tool that enables you to record audio from Chrome in high quality. Thanks to its advanced screen capturing technology, aside from streaming audio, you can grab more possible audio and video desktop activity as per your own needs, like YouTube audio, online radio, game music, self-demonstration, live chat, class lecture, podcasts, webinars, Skype calls, etc. More than that, it also includes full support to both system audio and microphone sound, which can be exported as MP3, AAC, WAV, M4A, M4B and FLAC. Alternatively, this intelligent program can as well show you top-notching recording options. 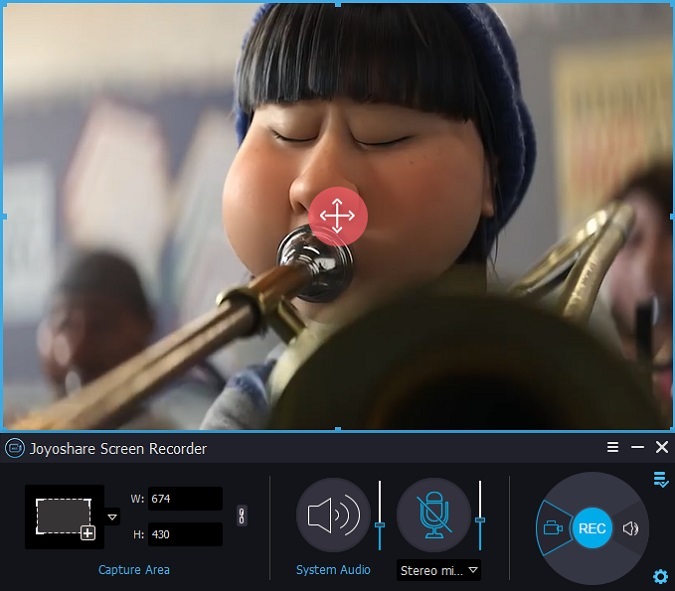 In details, you can apply cool cursor effects, cut recordings, skip unwanted sections, specify format configuration, etc. With built-in task scheduler, you can even create a recording assignment in advance. It's also available to edit ID3 tags info, including title, year, artist, composer, genre, cover, etc. in the way you like. 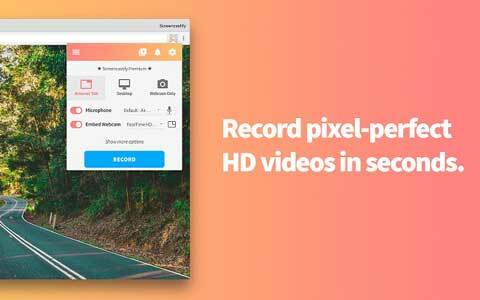 Screencastify is another trusted desktop audio recorder for Chrome, which can have effective performance in Google Drive, run fast offline and also be compatible well with your device without problem. In regard to recording, this tool makes it practical to narrate any doings with your microphone's audio. Aside from browser tab, it is capable of capturing desktop and webcam videos and audios, allowing you to customize both resolution and FPS flexibly. Best of all, it comes with some accessible editing features. Under the help of it, you can crop and trim recordings as you please. At the same time, it's workable to annotate you screen with a pen tool and focus a spotlight on your mouse. Afterwards, the captured videos and audios can be automatically saved to Google Drive. Or you can directly publish it to YouTube. The premium version can even let you output it as MP4 or animated GIF. 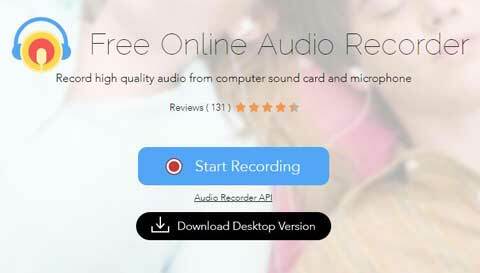 With clean and tidy user interface, Apowersoft Free Online Audio Recorder is also a superior Google Chrome audio recorder you can utilize. Without plug-in installation requirement, this smart tool empowers you to capture any audio from your computer sound card as well as microphone straightly. By means of it, you have right to record streaming audio, radio stations, voice chat, in-game sound, etc. handily, which can meanwhile help you generate Chrome audio in MP3, OGG, WMA, AAC, FLAC, WAV and M4A. To better organize your audio recording, Apowersoft Free Online Audio Recorder also delivers a wonderful platform to manage ID3 info, such as artwork cover, title, artist, year, album and genre. Don't forget to play all recordings in real-time so that you can remove the unsatisfying audio. Besides, the well-designed share function is able to permit you to share any designated audio file to YouTube, Google+, Soundcloud, Twitter and more social platforms. 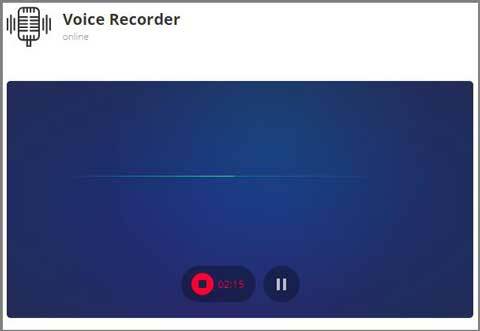 Online Voice Recorder is a quite lightweight tool that can be used to record your audio from Chrome and save it in the form of MP3. This Chrome audio capture is sincerely a reliable program for new starters as it not only easy-to-use but also charges no fee from you. Most importantly, it does well in detecting silence automatically at both beginning and the end of your recording. Furthermore, by making full use of the standard Adobe Flash Player, you are entitled to adjust your microphone settings, enabling hardware acceleration, decreasing echo, choosing accessible input devices, controlling volume, etc. at your own will. Additionally, it allows you to crop your Chrome audio to several sections according to your actual requirements. 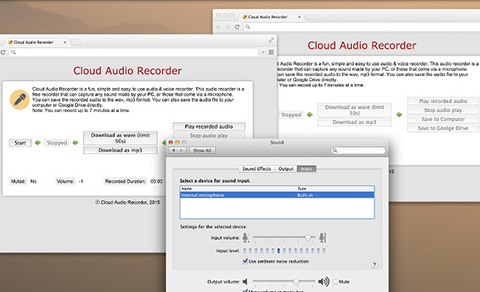 Cloud Audio Recorder is also a forthright extension for Chrome, which can be used to record either audio or video activities from Chrome in relatively straightforward way. With the exception of any sound made by your computer, it also offers convenience to capture the audio that comes via a microphone. Taking advantage of this compact Google Chrome audio capture, you can find it is fairly easy to grab audio from Chrome, Firefox, IE10+, etc. What's more, it enables you to select desired input device, adjust volume, use noise reduction, etc. based on your needs. Hereafter, any recorded audio can be exported to MP3 and WAV. You can simply store the result on your local folder or save it on Google Drive as well. Support Chrome, IE10+, Firefox, etc. All of above Chrome audio recorder tools are handpicked and listed here owing to its striking features. Explicitly, Online Voice Recorder can detect silence and decrease echo readily. Screencastify can support saving recording to animated GIF. Joyoshare Screen Recorder can show you spectacular options and broad formats. No matter which one you choose, you can benefit from its stress-free function. Now go ahead to have a try.